Uglyworld #859 - "Ha Ha Ha, Nerds!" (314-365), originally uploaded by www.bazpics.com. When Dave returned from the local supermarket tonight he didn't quite expect that when he unpacked his shopping that it would leave Ice-Bat rolling around on the couch in absolute fits of laughter. "Waaaaaa-ha's, nerds, ha ha ha ha haaaaaa! ", screamed Ice-Bat while trying to keep air coming in at the same time. Dave didn't quite know what to make of the little guys immense show of mirth, until Wage explained to him that the word Nerd can mean something completely different. 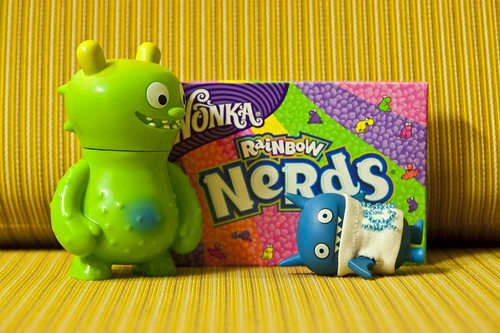 "Buts I liked the way nerds tastes! ", Dave replied to Wage which set Icy off on another fit of laughter.